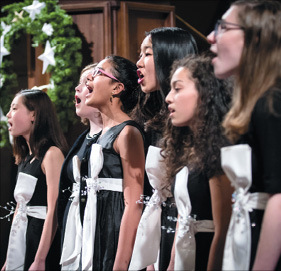 Bullis Charter School students sing at the Winter Choral Concert at First United Methodist Church in Palo Alto. Bullis Charter School students in grades K-8 and across five different choir ensembles performed at various concerts and festivals over the holiday season. Students in grades K-8 also joined teachers and parents in a holiday sing-along. Choir director David Belles said students have the opportunity to have a real choir experience throughout their entire time at the Bullis Charter School, studying high-quality choral repertoire, receiving authentic vocal instruction and participating in many different types of choral performances. “Participating successfully in these activities, some of which may be outside their comfort zone, allows our students to stretch themselves in new and unique ways that might otherwise remain outside their experience,” he said.